Find out about Boston’s witches, learn about local serial killers, and hear stories about murder and mysticism during two special walking tours this month. Boston By Foot takes participants on a stroll from Beacon Hill to the South End during the Murder, Martyrs, and Mysticism tour, Oct. 19 at 6 p.m. Hear about the “Frogpondians” who broke the law and the woman who lured Houdini to Boston, and see sites that will make you hair bristle. Or join the Beacon Hill with a Boo walking tour on Oct. 31 at 6 p.m., and hear grisly tales as you wander through some of the quiet neighborhood’s dark alleys. Both tours last 90 minutes. $5/$15 per person for members/non-members (Murder, Martyrs, and Mysticism); $10/$20 (Beacon Hill with a Boo). 617-367-2345, www.bostonbyfoot.org. Climb into a quad car and ride the rails along Narragansett Bay after dark. Rail Explorers Rhode Island has launched a special Halloween tour, called Terror on the Tracks, that takes riders on a 6-mile journey along the Newport and Narragansett Bay Railroad with s’mores and hot chocolate en route. Tours run Thursdays through Saturdays until Oct. 31; $85 (tandem) to $150 (quad). 877-833-8588, www.railexpl orers.net. Then head to Roger Williams Park Zoo, where you can see more than 5,000 carved pumpkins on display until Nov. 5. Hop on the Soaring Eagle Zip Ride for a nighttime aerial view of the zoo and thousands of pumpkin creations. Zoo entry $12-$15; soaring tickets $15 per person. 401-785-3510, www.rwpzoo.org. Snowmobile around a volcano, ride a super jeep into a remote valley, and watch the Northern Lights while snowshoeing on a new Iceland adventure. 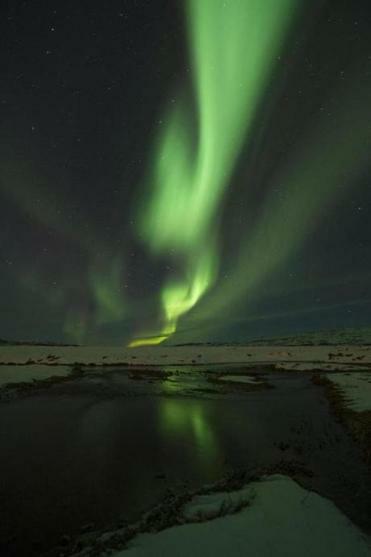 Sign up soon for Adventure Life’s new 8-day Winter Iceland Adventure, departing Feb. 10 and April 1. Fly into Keflavik and drive east to south Iceland, where you’ll soak in hot springs, see volcanoes and remote valleys, and visit a glacier and the first location of the 2010 eruption of Eyjafjallajokull. Then visit waterfalls, black sand beaches, and basalt columns before strapping on crampons and learning the basics of hiking across glaciers. Wrap up with a free day to explore the capital city of Reykjavik, where you can go whale watching, ride Icelandic horses, or snorkel the Silfra Fissure between the North American and Eurasian continental plates. Starting price: $3,775. 800-344-6118, www.adventure-life.com/iceland/tours. Head up to the West Hills neighborhood of Portland, Ore., and you’ll find one of the most authentic Japanese gardens outside of Japan. The Portland Japanese Garden has reopened following a $33.5 million expansion that added 3.4 acres to the existing 9.1-acre property and boosted cultural experiences for visitors. The International Institute for Japanese Arts and Culture now offers master-level workshops, public lectures, and seminars on traditional skills and techniques for creating Japanese-style gardens. The expansion also includes a new cultural village outside the main gate and a 20-foot Japanese medieval castle wall. A new courtyard showcases performances and events, and three LEED-certified buildings house a library, classrooms, and a tea café. Admission (includes access to the garden, gift shop, café, and Art in the Garden expeditions: children 5 and under free; ages 6-17 $10.45, seniors $12.95, and anyone 18 and older $14.95. 503-223-1321, www.japanesegarden.org. Roll up Rad Dog’s Pocket Bowl and take it whenever you go on a walk or an adventure with your furry friend. This super-compact bowl, which weighs less than an ounce, folds up to about the size of a key fob and easily tucks into a pocket or purse. Or throw on a mini clip and attach it to your dog leash. Once unfolded, the waterproof nylon bowl looks like a durable upside-down shower cap — the perfect shape for holding up to 16 ounces of food or water. The USA-made bowl comes in black or red. $11.95. 360-647-9868, www.myraddog.com. Drop your phone in a puddle and you can race to the rice bowl, or just slip it into Absorbits new Wet Phone Rescue Pouch. This clever case, which comes packed with silica, can supposedly revive your device better than rice. Turn off your phone, take out the battery, and wipe off any obvious water. Then slip the phone and battery into the padded case, and the pouch instantly starts extracting water from your device. Give it up to 24 hours and then turn on your phone to see if it works. The reusable pouch weighs 5 ounces and measures 7.5 inches by 5 inches, making it small and light enough to bring on your travels. $9.99 on Amazon.com. www.absorbits.com.